I haven't posted for a while simply because I have a cracked nail and I'm trying to fix it before it breaks. I will make a separate post about that once I get it patched properly. 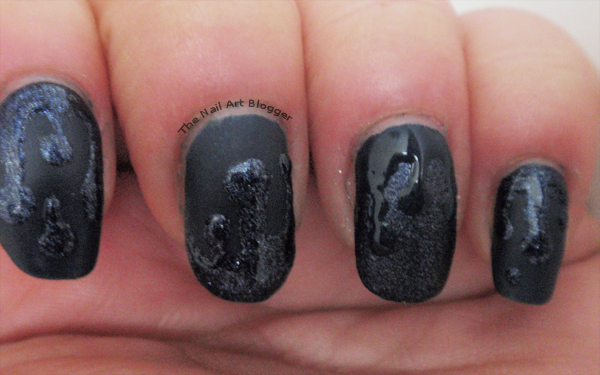 As for this post, last week I bought the jeans sugar polish from Essence and wanted to try it out in combination with my other jeans colored polish from Catrice. I must apologize for the quality of the photos. My tripod broke when I wanted to take photos, and so I took photos without it, thus resulting in some pixelation because I don't use flash and it was a cloudy day. 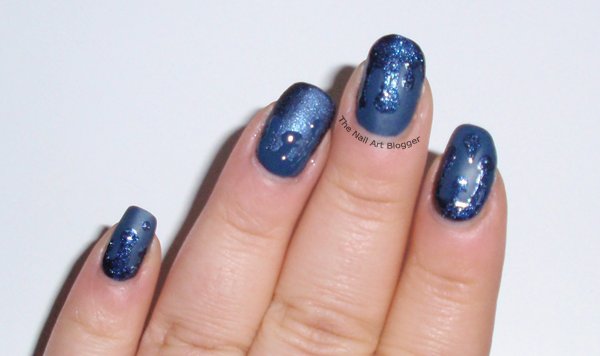 I painted my nails with two layers of #350 Hip Queens Wear Blue Jeans from Catrice, except for the ring finger, and I painted that one with two layers of #07 blue-jeaned from the sugar effect nail polishes by Essence. I let them dry and then painted a layer of matte top coat from Kiko. After my nails were dry, I took a dotting tool and a detail brush and started making a melting paint design. I went for opposite effect. Meaning I used the Catrice polish on the ring finger, and the Essence one on the other fingers. After I was done, I grabbed a top coat and using the detail brush I carefully went over the melting design to give it an extra shine. The polish never dried, because it was too thick, and the top coat I used was the 8in1 nail wonder by P2, which never dries even with a thin layer (I have no idea why I keeping using it). Which is why I never got the chance to re-take the pictures on the next day with a better lighting. I woke up with bedsheet prints over all of the nails. I must say that I absolutely loved the end result even though it didn't last long. I have only done the melting paint kind of design once before, so I didn't have a lot of practice. But this was quite successful in terms of how it looked. The fact that it was too thick is another thing I need to work on. I would love to hear your opinions about this design. Thank you very much for commenting! I will try to do this same design again at some point, but with less nail polish and hope it would dry better :) And thanks for following! Love the manicure, especially the matte look!